As we close out 2016, we want to thank to all of our loyal customers for another great year. Yet again, we’ve had the wonderful opportunity to build relationships and continue providing the the world class customer service you deserve! 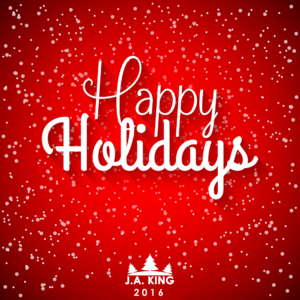 As we celebrate the holidays, all of our full service locations will be closed on the following days. If you have any questions about services at embedded sites, please contact our administration at each location. For a complete list of our full service and embedded sites, take a look at our J.A. King Location page.